This is the first sound version of Iron Mask, and stars Louis Hayward in the dual role of King Louis XIV / Prince Philippe. Hayward was a leading man who appeared in a variety of parts, heroic and romantic, from the late 1930s to the early ‘50s, but if he’s remembered today, it’s as the star of eight or nine small to medium-budget swashbucklers made mainly for independent producer Edward Small (of which this is the first). The genial Hayward didn’t have the compelling screen presence of Errol Flynn or Tyrone Power, but he was likeable and determined, with enough handsome charm to carry off the romances. The Man in the Iron Mask is the final tale in Alexandre Dumas’s long Musketeers Cycle, which tells the stories of d’Artagnan and his three friends Athos, Aramis, and Porthos from youth to old age. And no movie version of Iron Mask has ever told that tale the way Dumas wrote it. Oh, you always get a plot to switch King Louis XIV with his twin Philippe, who was spirited away at birth and raised somewhere secretly, and somebody always winds up wearing a welded-on full-helm iron mask—while of the musketeers, d’Artagnan at least puts in an appearance. Other than that, all bets are off. This adaptation is no closer to Dumas than any other version, so let’s just toss the author out a tower window like an old tin plate and look at this movie on its own merits. 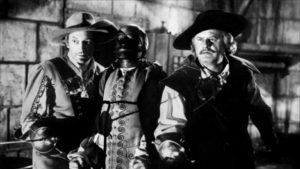 These are considerable: first, it was directed by James Whale, best known for his classic horror movies Frankenstein and Bride of Frankenstein, and he does a fine job making the dungeon scenes involving the iron mask quite chilling. He also turns out to be pretty good at costume drama: this movie moves right along, and never flags until just before the end. In this version, as an infant Prince Philippe is given into the care of d’Artagnan, who takes him to distant Gascony to raise him with his three musketeer friends as tutors. D’Artagnan is played by Warren William, who’d been very popular earlier in the thirties, but whose star was by this time fading. He’s a curious choice for the role: he’s not very athletic, which had been a hallmark of the part since Fairbanks (and still is), and though his long, droll face looks good with a pencil ‘stache and goatee, he’s not a convincing swashbuckler, and he doesn’t always remember to act engaged and engaging, or even interested. Hayward, on the other hand, is clearly enjoying himself, switching back and forth between the cruel and tyrannical King Louis and the bold and boisterous Philippe. Bonus: as the impostor king, he gets to romance Queen Maria Theresa (Joan Bennett), who is sadly ignored by the real Louis XIV—possibly the only touch of historical accuracy in the picture. So there’s plenty of good stuff. On the downside, the awful Alan Hale, Sr., is inflicted upon us once again, though if he’s suited to play anybody I suppose it would be Porthos, as he does here. Also, though the costumes are good for a B-picture, everybody fences with these flimsy little foils that are no substitute for an honest rapier. Finally, this movie just has one climax too many, an unnecessary carriage chase through the too-familiar woods of southern California, before the musketeers finally save the day. Look, it’s no Adventures of Robin Hood, but it’s worth your time nonetheless. Watch for the venerable Nigel Brulier in the prologue reprising the role of Cardinal Richelieu that he played in Fairbanks’s silent versions of both The Three Musketeers and The Iron Mask.